To Cook the Mussels: Clean the mussels individually under cold running water, scraping off any clinging barnacles or "beards". Discard any half-open shells or any unusually heavy ones, indicating internal grit. Wash in several changes of cold water, lifting out of the water so the sand stays in the bowl. Place the shallots, wine, butter, chopped parsley, sprigs of thyme, pinch of salt, and about 3 turns of the pepper mill in a medium saucepan. Bring to a boil over high heat. Reduce and simmer for 3 - 4 minutes. Add the mussels and turn up the flame to high. Bring to a boil, cover, and allow to cook for about 4 minutes or until all the mussels are open. Shake the pan of mussels once or twice while cooking. Remove mussels from the saucepan with the aid of a slotted spoon and let cool. Mussels can be cooked ahead of time, then set aside. To Prepare the Garlic & Herb Butter: Soften the butter at room temperature for 1 hour. Whip the butter and all the other ingredients together with an electric mixer or food processor, or with a wire whisk. Cover and refrigerate until ready to use. 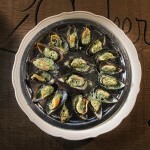 To Serve the Mussels: Butter a flameproof dish, just large enough to accommodate the mussels in a single layer. 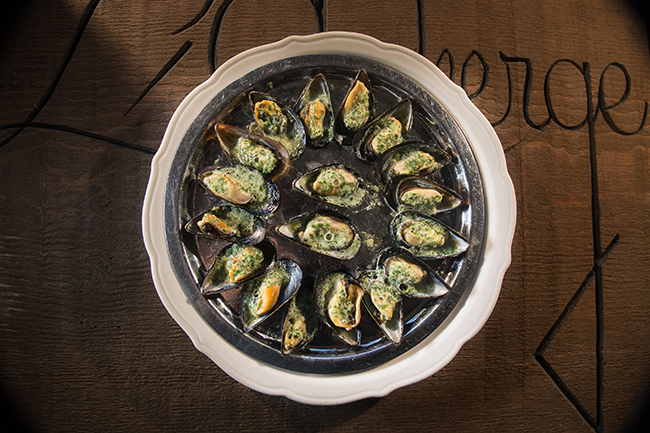 Dot each mussel with the garlic & herb butter and place under the broiler until the butter melts. Serve at once with a French baguette.